This MySelect E Vario 3 Spray Shower Slider Rail Kit is sturdy, easy to clean and comes with a smooth running shower slider. It allows you to fix the shower head to the perfect height – whatever your size, or showering position. The shower slider can be conveniently angled so it can be adjusted to your specific needs. It features 3 spray patterns: Rain - perfect for rinsing shampoo out of your hair, IntenseRain - perfect for setting yourself up for the day washing morning tiredness down the drain, TurboRain - a revitalising, powerful spray providing a refreshing shower experience. The QuickClean rub clean nubs loosens any limescale deposits making sure your hand shower looks beautiful, and stays working for longer. 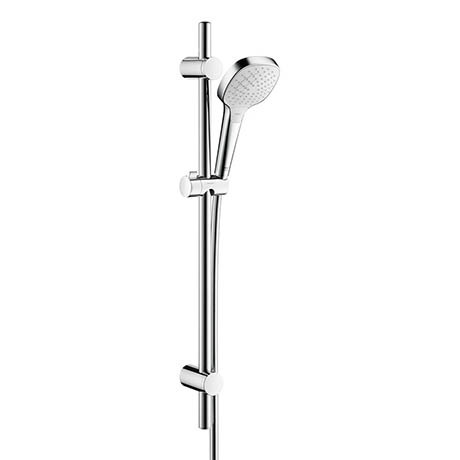 Consists of handshower, 65cm slider rail and shower hose.